GEOTHERMAL – the green alternative to heating and cooling your home or business! Geothermal, also referred to as earth-coupled heat, geo-exchange, geothermal heat pumps (GHPs), ground-source heat pumps (GSHPs), ground Source Heat Exchange systems, and water source heat pumps is one of the most efficient ways for heating and cooling a home or building of any size. These systems can be installed in new homes or buildings or retrofitted into existing homes and buildings. The temperature of the ground beneath the earth’s surface remains relatively constant throughout the year, even though the outdoor air temperature may fluctuate greatly with the change of seasons. These systems don’t have to work as hard (therefore using less energy) because they are drawing from the earth’s constant temperature. There is a series of loops installed in boreholes that are drilled into the earth and then connected by pipes to move liquid (most often water) through the loops and into a heat pump inside the home. In summer, the relatively cool ground absorbs a home’s waste heat more readily than the warm outdoor air. The heat pump concentrates the earth’s thermal energy and transfers it to air circulated through interior ductwork in your home or building. This works conversely in the winter. 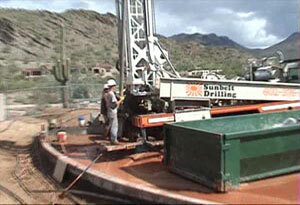 Geothermal Systems are a cost effective, energy efficient and environmentally friendly way of cooling and heating. The EPA has confirmed geothermal systems operate at 75% greater efficiency than oil furnaces, 48% greater efficiency than gas furnaces and 40% greater efficiency than air source heat pumps. In most cases, your air conditioner is the largest consumer of energy in your home. Your monthly utility bill reflects the difference in electricity used during the summer months verses the winter months and vice versa in Arizona’s high country. New geothermal technology in Arizona allows your home to greatly reduce the amount of electricity used in the peak seasons, saving you money. 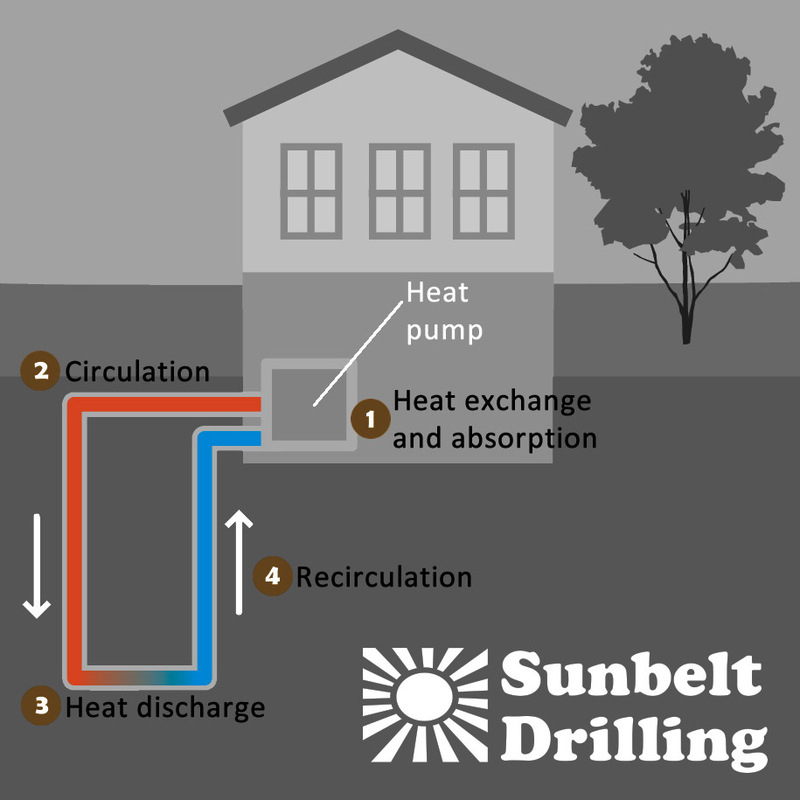 Sunbelt Drilling, LLC is a Geothermal Well Drilling Contractor that has installed a full range of geothermal systems ranging from Residences, to Commercial Businesses, to Large School Projects and Hospitals. We have been licensed Drillers in Arizona for over 32 years and are IGSHPA (International Ground Source Heat Pump Association) certified!